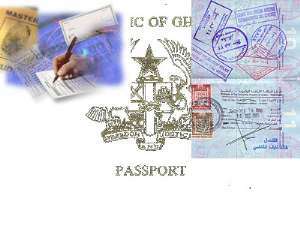 ..... entourage defrauded by Great African Travels and Tour Accra, Feb. 16, GNA - Twenty-five queenmothers and their entourage numbering sixty-four who trooped to the British High Commission last Monday with the hope of collecting their visas to enable them to visit Queen Elizabeth of England found that their applications had been refused. The Queen mothers, fully dressed in the various traditional or ceremonial regalia, were from the Volta, Ashanti, Brong Ahafo and the northern regions. But they had another shock later when Nana Yaa Bodom, 51, Managing Director of Great African Travels and Tour, who had planned the tour and collected 3,000 US dollars each from the 64 people, including the queenmothers, totalling 192,000 US dollars, failed to refund the money. On Wednesday, Bodom appeared before a Circuit Court charged with defrauding by false pretence. Her plea was not taken and the case was adjourned to February 22. She was remanded in Police custody to assist in further investigations. Prosecuting, Chief Inspector Bennett Safo told the court, presided over by Mr Nathaniel Osam that last year, the accused person went round the country claming that she was organizing a tour of London for Queenmothers nationwide to visit Queen Elizabeth and other traditional institutions in the United Kingdom. Chief Inspector Safo said Bodom succeeded in collecting an amount of 3,000 US dollars each from the sixty-four people but failed to honour her promise.